There is plenty of science that shows gratitude and being thankful for the things you have as being linked to less stress and anxiety. Mental and emotional stress can lead to unneeded worry and physical health problems. So all you need to do is learn to recognize the situations in your life that you should be grateful for, and you can be healthier both mentally and physically. 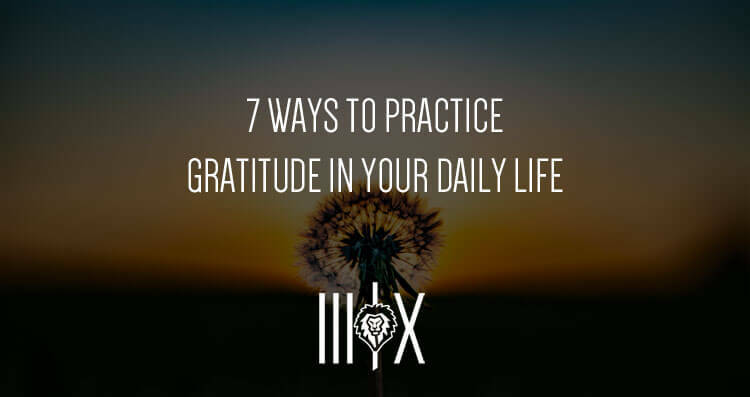 Practice gratitude in the following 7 ways and you will find more health and well-being in your life. There is probably someone in your life right now that you need to thank for something. Take time to send them a handwritten letter of thanks. Don’t email them or text them. The time that you take to express your feelings by writing them down means more lasting rewards than using electronic media. On your “grateful calendar”, write down 3 to 5 things you are grateful for each day. After writing them read them out loud. Keep this calendar where you can see it constantly. Each day, say “I’m grateful for you” to important objects, events and people in your life. Take a different friend, family member, acquaintance, co-worker or service provider each day of the year. Tell them that you are grateful for their presence in your life. This works a couple of ways. It lets people know that you care about them and appreciate them, and it also forces you to expand your circle of influence. We take so much for granted. Many people in the world do not know if they are going to eat every day, while most of us have several choices as far as what food we are going to put into our mouth, how much we eat, and when we eat. Whether you have an abundance of food or eat sparingly, express gratitude for the food you put into your body. You may lament the fact that you don’t have as many clothes, pairs of shoes or possessions as you would like. Find someone who has less than you. Give them something of yours. This can quickly make you realize how much you really have. Go to the nearest mirror. Do you see that person staring back at you? That is the person you should be most appreciative of. You obviously love your friends and family, but you need to express self-love first before you can form the deepest relationships with others. Frequently look yourself in the eyes and express gratitude for who you are and what you have given yourself.